Our cardinal from last winter has returned to us, after having spent the summer holding a territory in the neighbour’s backyard just down the road a short distance. When he arrived a month ago he was alone, but a week or two later a female showed up, and has periodically joined him at the feeders. 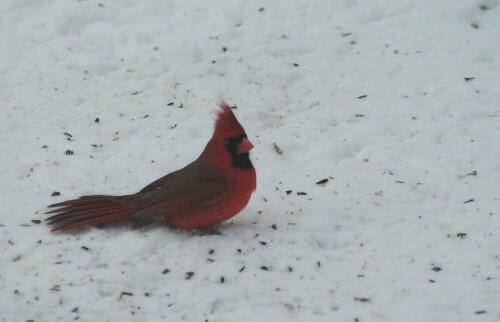 I presume she’s his mate from the summer; cardinals remain paired up even through the winter months. I was glad to see he’d found one; being the only cardinal for, seemingly, kilometers, I was worried that no girl would find him. And chase it off. Blue Jays are a shade larger than cardinals, but cardinals have the more powerful beak. Does the jay know that, do you think? Because jays themselves are usually pretty bossy. Interestingly, the Birds of North America species account notes antagonistic interactions at feeders with House, Field, Harris’ and White-throated Sparrows, but doesn’t mention other species. In parts of the country where cardinals are abundant (which isn’t here), they may group together in flocks of a few individuals up to several dozen, and while individual distance is maintained within the flock, they do move together (described as a “tank-tread like” movement as birds at the back of the flock leapfrog to the front). The BNA account also states that these flocks can sometimes be associated with other species, including juncos, White-throated Sparrows, titmice, tree sparrows, goldfinches and towhees. Perhaps that’s why it differentiated between the chickadees and tree sparrows, and the Blue Jays? 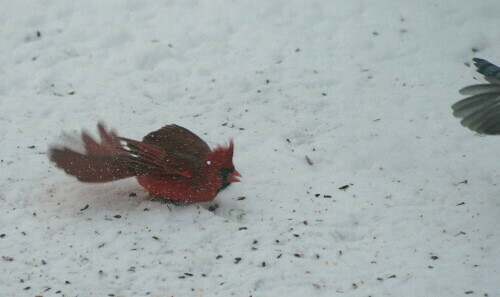 And, not related to anything, I love that you can see the red reflected on the snow under his tail in the middle photo. I witnessed a flock of cardinals while hiking through a state park in TX. There must have been 30 of them -okay, maybe 20-feeding in and around this one giant tree. I’d never seen so many in one place. It was quite impressive. Cardinals are so beautiful, and since we don’t have any here and I miss seeing them I really enjoyed this post. Thank you for sharing it! Great photo sequence! Amazing how smaller birds can really tell off bigger ones, isn’t it? That’s impressive! I’ve never seen a cardinal take on a jay before. And jays being who they are, I’m surprised the cardinal won that disagreement. I’ve noticed at my feeder that the battle is different on the ground than it is up above. 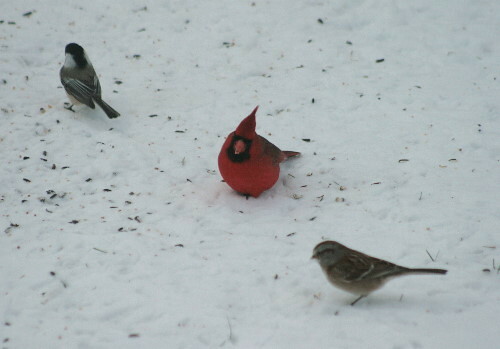 On the ground, the birds seem to be more tolerant of each other. Above in the feeder though, it is a constant fight. Steller’s Jays, then nuthatches, then chickadees, etc. I’ve even noticed that the Steller’s Jays rank higher than the squirrels! I’ve been pleased to see a male and female occassionally at my feeder the last few weeks. 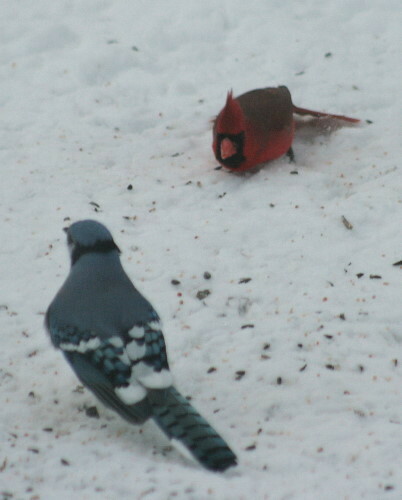 The feeder is dominated by many blue jays and the cardinals seem very cautious in approaching. They seem more comforable gleening dropped seed on the ground. The dynamics of tree sparrow/ junco flocks are interesting. I also found it interesting, when I was ground feeding, that the squirrels would mostly keep all birds from visiting except mourning doves, who seemed to be able to co-feed with squirrels. Thanks for the comments, everyone! He’s definitely become number one at the feeder, though I think he still defers to the squirrels. Interestingly, I haven’t seen his wife do this at all – she’s not here all that often, and seems more timid when she is. Interesting observations, Mike B and Barefootheart. I suppose that such aggregations of wildlife are rather unusual in natural circumstances, and it’s interesting to see how everyone sorts themselves out in the artificial environment we create at the feeders. And I’d love to see a flock like that, KaHolly! I think the most I’ve ever seen together has maybe been three. This was so amazing. I love your blog!